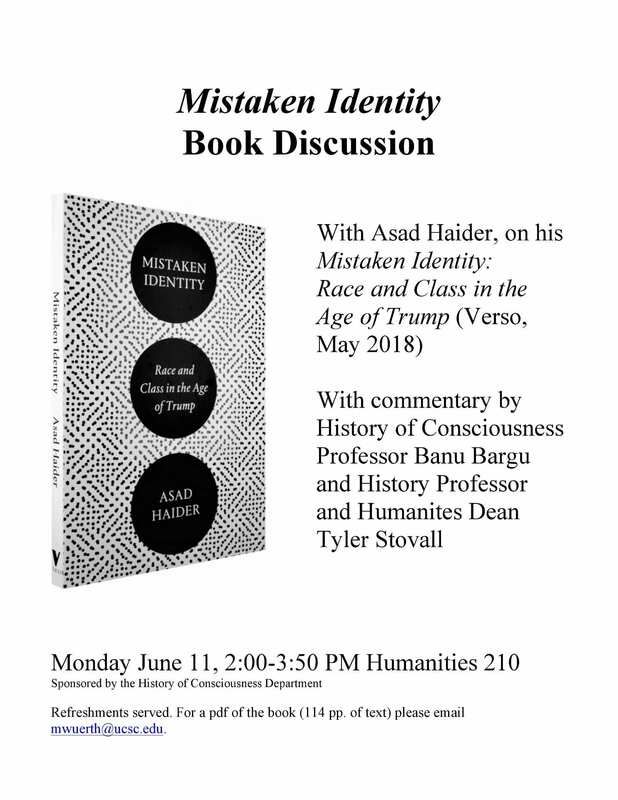 Commentary with be provided by: History Professor and Humanites Dean Tyler Stovall and History of Consciousness Professor Banu Bargu. Refreshments served. For a pdf of the book (114 pp. of text) please email mwuerth@ucsc.edu. Hope to see you there! 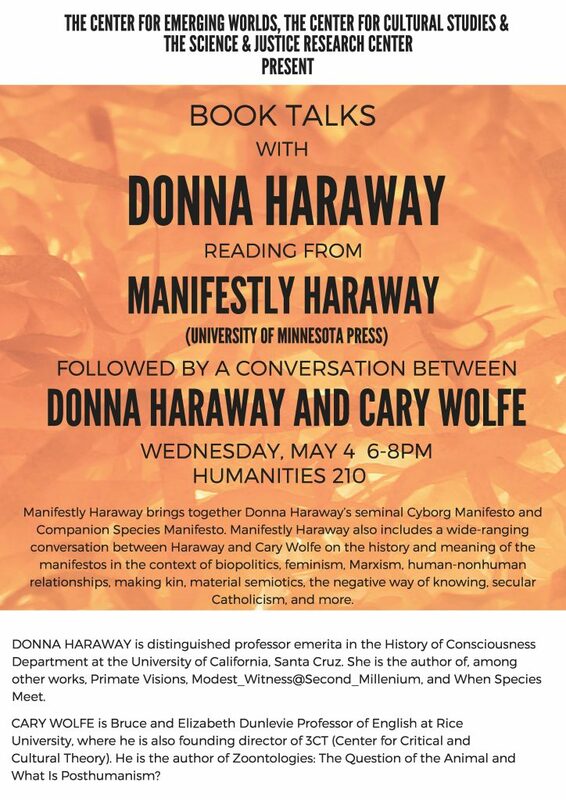 Manifestly Haraway brings together Donna Haraway’s seminal “Cyborg Manifesto” and “Companion Species Manifesto.” Manifestly Haraway also includes a wide-ranging conversation between Haraway and Cary Wolfe on the history and meaning of the manifestos in the context of biopolitics, feminism, Marxism, human-nonhuman relationships, making kin, material semiotics, the negative way of knowing, secular Catholicism, and more. 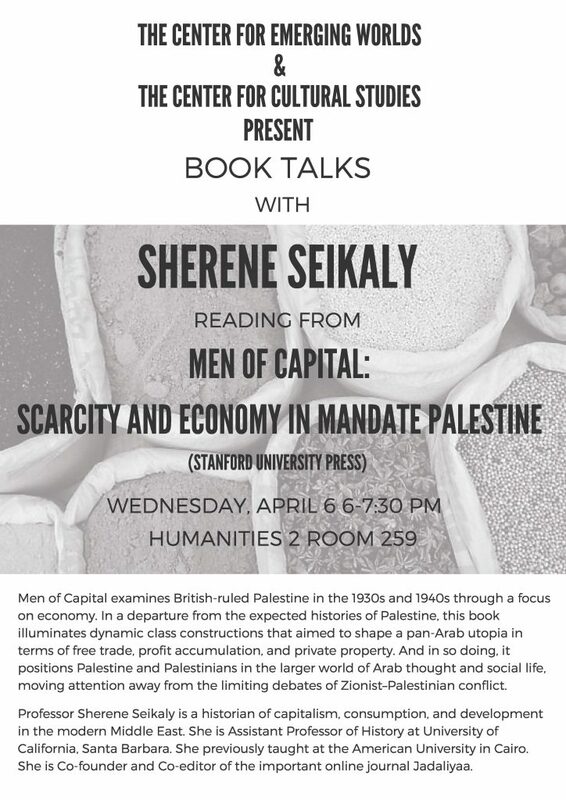 Men of Capital examines British-ruled Palestine in the 1930s and 1940s through a focus on economy. In a departure from the expected histories of Palestine, this book illuminates dynamic class constructions that aimed to shape a pan-Arab utopia in terms of free trade, profit accumulation, and private property. 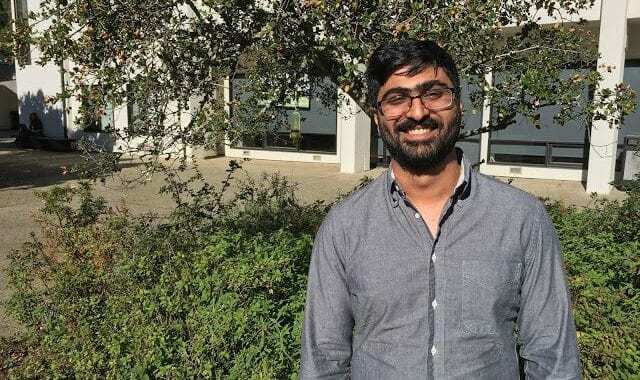 And in so doing, it positions Palestine and Palestinians in the larger world of Arab thought and social life, moving attention away from the limiting debates of Zionist-Palestinian conflict. Professor Sherene Seikaly is a historian of capitalism, consumption, and development in the modern Middle East. She is Assistant Professor of History at UC Santa Barbara. She previously taught at the American University in Cairo. She is Co-founder and Co-editor of the important journal Jadaliyaa. UC Santa Cruz’s Center for Emerging Worlds and the Center for Cultural Studies present this new series, Book Talks, which invites authors to read from their books and engage in discussion. Please visit the Center for Emerging Worlds’ website for more information on their work. A tale of diversity within our damaged landscapes, The Mushroom at the end of the World follows one of the strangest commodity chains of our times to explore the unexpected corners of capitalism. In all its contradictions, the matsutake mushroom offers insights into areas far beyond just mushrooms and addresses a crucial question: what manages to live in the ruins we have made? 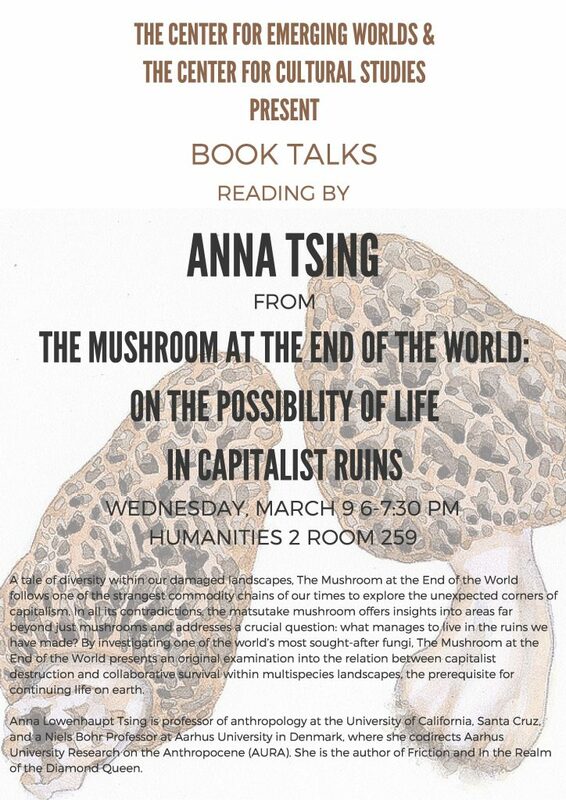 By investigating one of the world’s most sought-after fungi, The Mushroom at the End of the World presents an original examination in to the relation between capitalist destruction and collaborative survival within multispecies landscapes, the prerequisite for continuing life on earth. 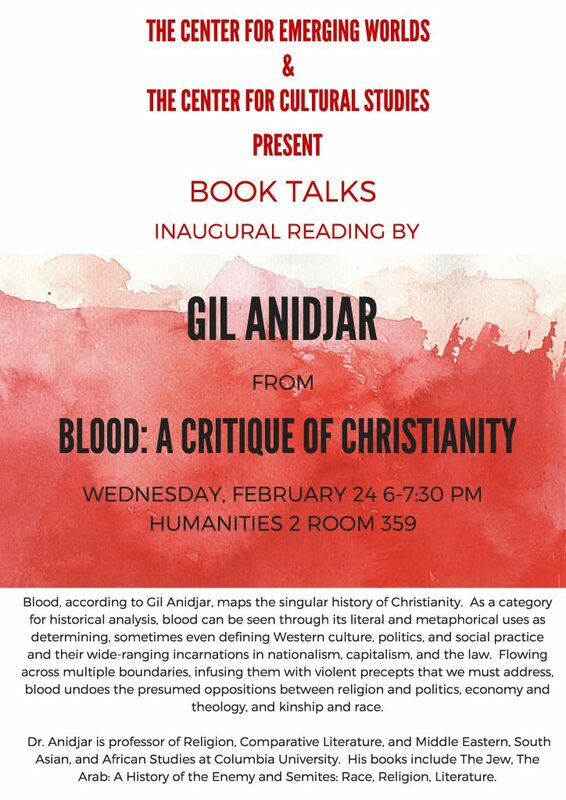 Blood, according to Gil Anidjar, maps the singular history of Christianity. As a category for historical analysis, blood can be seen through its literal and metaphorical uses as determining, sometimes even defining Western Culture, politics, and social practice and their wide-ranging incarnations in nationalism, capitalism, and the law. Flowing across multiple boundaries, infusing them with violent precepts that we must address, blood undoes the presumed oppositions between religion and politics, economy and theology, and kinship and race. Dr. Anidjar is professor of Religion, Comparative Literature, and Middle Eastern, South Asian, and African Studies at Columbia University. His books include The Jew, The Arab: A History of the Enemy and Semites: Race, Religion, Literature.